We set off in cool but sunny conditions and took the path to Ollerbrook and onwards to the Youth Hostel. On arrival at Jaggers Clough we took a break and then followed the track to Hope Cross. 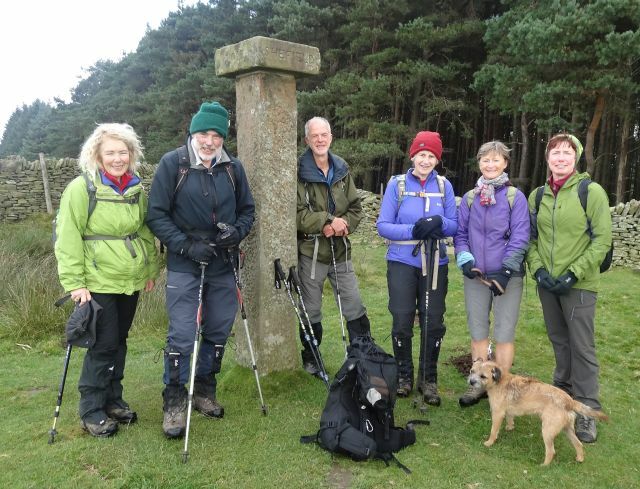 Here we posed for the customary group photo (courtesy of Dave C.) and then commenced the long gradual ascent to the summit of Win Hill, where a bright and breezy lunch was taken with the Hope Valley spread out below us. To the east the colours of the high moorlands and edges were superb. At this point Tiggy decided to lead his two companions down to Hope station, whilst the rest of the party proceeded down towards Thornhill and thence to the garden centre. Here it was unanimously decided to investigate the tea room and it’s facilities. Suitably refreshed, we spent a pleasant hour walking beside the River Derwent in the sunshine to Leadmill Bridge, and then to the cars. A very enjoyable 12.2 miles. Thanks to all who have led and supported the first season of Summer Sunday monthly walks. There have been 8 walks, visiting both Dark and White Peak areas, the environs of the Goyt Valley and the land to the West of Chesterfield. Parties have varied in number between 2 and 11, and distances between 10 and 19 miles (total all walks 105mls! ).